Videx offer the most comprehensive range of audio, GSM and video kits and are one of the leading suppliers and manufacturers of door entry and access control products in the UK. The modular door entry systems provide the solution to a vast range of installation requirements and enable the system to be built to the customer's exact specification. Below you will find information on some of our more popular products or from here you can go directly to the Videx website to view their complete range of products. 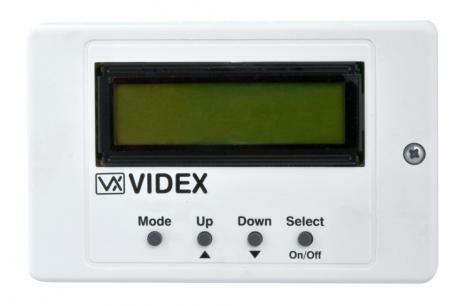 Videx GSM entry systems are supplied in both kit and modular form which can be supplied with up to 10 call buttons. All systems are available with the option of a digital keypad. 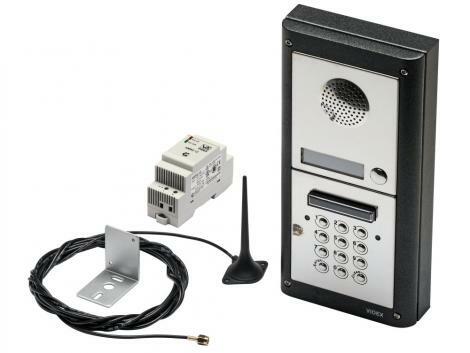 GSM access control is a wireless solution using mobile phone technology via a SIM card. The system can be set to ring any mobile or landline telephone number (excludes ex-directory numbers) and allows the user to speak to the visitor and open the gate if required simply by pressing number '3' on their telephone. Any mobile or landline number which is stored in the GSM address book can dial the unit to open the gates. The call is immediately rejected and a command sent to open the gates. There is no charge for these calls. The system has the capacity for up to 250 access codes to open the gates. This system is extremely popular for remote site installations or when the gates are a considerable distance as no cabling back to the property is required. Gate intercom systems allow you to communicate clearly with your visitor before you allow them to enter your property. The system is activated when the button at the gates is pressed which then rings the control panel in the house to alert you that you have a visitor. You can speak to the visitor and open the gates from the intercom system when you are happy that you want the visitor to enter. Wired intercom systems require cabling from the gate to the property. The system is completely modular so there are many different button configurations with the option of an additional keypad for added convenience. Digital keypads can be used as another form of access for the gates. The keypad can be mounted to a wall, gate post or mounted onto a post at a height convenient for vehicles. Videx have a variety of keypads to choose from, each with a variety of features including multiple codes (4-8 digits), back lit keys, surface or flush mounted, standard or vandal resistant. The keypads also come in a range of different colours and finishes. Keypads are a very convenient and user friendly option but are not the most secure way of securing your property as your keypad code could be passed on by someone you have previously given the access code to. There are no restrictions as to the amount of times you change your keypad code should you feel it is necessary. Time clocks can be installed to any gate automation or Intercom system. The addition of a time clock enables the gates to be kept open for a specific length of time, at a particular time of day. The Videx Time Clock can be set for a single day of the week, weekends, week days or every day of the week and has automatic British summer time correction and battery backup. All the information is displayed on an easy to read 2 lines 16 characters back lit LCD display and the time clock is secured within an ABS white plastic wall mountable box. Both of these systems are normally used in commercial situations or in situations where multiple properties share access. Swipe cards pass though a magnetic reader to activate but proximity systems use contactless technology and only need to be held close to the reader to operate. Each card or fob is individual to guarantee a high level of security. The person responsible for the system can add or delete individual users as required with minimal disruption. All automatic gates can be operated by radio transmitters. These items are also referred to as "zappers" or remote controls. The transmitter is pointed in the general direction of the gates and when the button is pressed a signal is sent to the gates which command the gate into its opening or closing cycle. The hand held transmitters are available in 2 and 4 button options. With the use of additional receivers, a 4 button transmitter can operate up to 4 different devices independently, for example two separate automated gates and two automated garage doors. A Ground loop is essentially a large metal detector located in the ground which will detect a large metal mass such as a car passing over it. Upon detection of metal, the loop will trigger the gates to open automatically to allow the vehicle to enter or exit. This device can also be used as an additional safety feature when situated near the gates to stop them closing on vehicles. A simple and cost effective method of opening or closing the gates. This method is very practical and easy to operate. As above but this method provides minimal security.